One of Africa’s most legendary and celebrated musicians, Hugh Masekela, this last weekend fulfilled a long standing wish and visited the burial place of his old friend, Zimbabwe’s iconic Mbira musician, Dumisani Maraire. 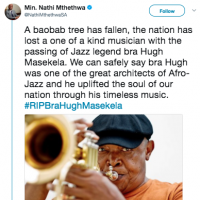 Masekela, who was meant to headline the postponed Harare Jazz Festival on September 13, could have cancelled his trip to Zimbabwe, but insisted that the other parts of his programme in the country were just as important. Dumi Maraire is famous for taking mbira music to the USA and starting a cultural movement that lives on to this day. Dumi was born in Mutare, on December 27, 1944. He began learning music from family members, and later at the college of music in Bulawayo. Maraire taught from 1968 through 1972 at the University of Washington in Seattle, where Chiwoniso was born. He remained in the region throughout until 1982, teaching at The Evergreen State College in Olympia, Washington, giving private music lessons, performing in Pacific Northwest cities and in British Columbia with several marimba groups he founded. 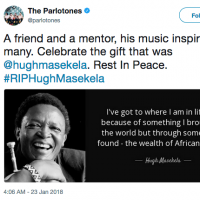 He passed away on November 25, 1999 and was buried at the Maraire family homestead in Chakohwa Village, Mutambara in the Chimanimani area of Zimbabwe’s Eastern Highlands. 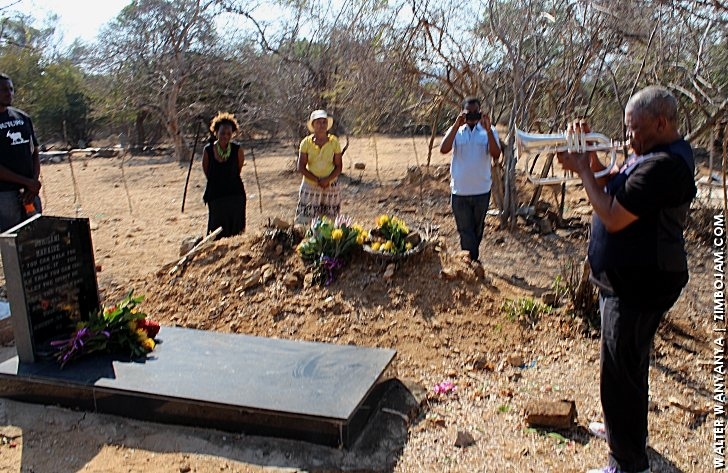 When his daughter, Chiwoniso, died on July 24, 2013, she was to be buried next to her father. On Saturday, September 13, 2014 , Bra Hugh Masekela fulfilled his long term wish to visit the resting place of his two friends. He was accompanied by members of the Maraire Familiy, including renowned Neurosurgeon and Mbira Month chairperson, Nozipho Maraire. Also with him were some of his Zimbabwean friends, Sam Mataure, Victor Kunonga and Walter Wanyanya. 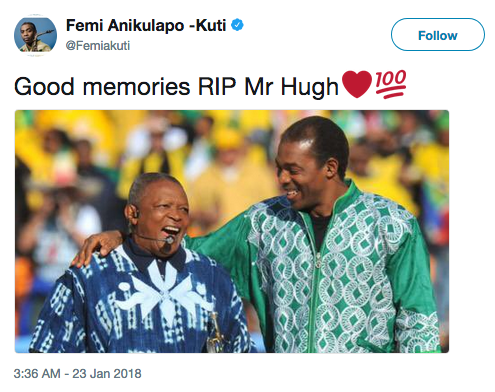 Bra Hugh wiped dust of Dumi’s grave before laying flowers on it. He also laid flowers on Chi’s grave which is yet to be built up. “Rest in peace,” he said. 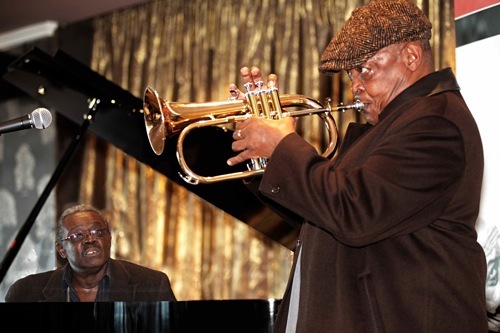 Then, after a few moments of bowed heads, Bra Hugh took out his trumpet and played a song for his departed friends. Later on, after the dust from the Chimanimani trip had settled, Bra Hugh revealed that his great grandfather was from Zimbabwe. “My great grand father was from here. His name name was Munyepawo – which is our real surname. These borders that separate our countries are articifial,” he averred. Last week, the inaugural Hugh Masekela Lecture was held at the University of Johannesburg’s Soweto Campus, and another great Zimbabwean friend of Bra Hugh’s, musical icon Oliver Mtukudzi, gave the lecture. While he is in Zimbabwe, Bra Hugh will continue the recording a musical project that he started with Chiwoniso while she was still alive. He leaves on Wednesday. The Yuletide season couldn’t have started on a better note for Bayelsans and numerous jazz enthusiasts who stormed the Gloryland Cultural Center, Yenagoa on Saturday, December 7 for the inaugural edition of the Bayelsa International Jazz Festival. All over Yenagoa, which is fast earning a reputation of a town that never sleeps, Christmas decorations give visitors a feel of celebration. It therefore came as no surprise that the Gloryland Center, venue of the jazz fiesta was filled to capacity. The atmosphere at the venue was carnival-like. It is doubtful that there were unoccupied seats as those who couldn’t get a place to sit, stood for the better part of the lively show which opened with a heart lifting rendition of the national anthem by Timi Dakolo. The Bayelsa International Jazz Festival took place two days after the death of highly revered Anti-Apartheid icon and first black president of South Africa, Nelson Mandela. After leading in observing a minute of silence in respect of the late African leader, Governor Dickson announced that the festival was dedicated to him. The announcement was met with loud jubilation even as the governor declared that Mandela’s legacy is indelibly etched in the hearts of millions across the world. 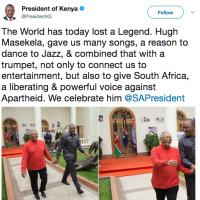 The governor was to return to the stage for a second time to present legendary South African musician, Hugh Masekela with the honorary citizenship of Bayelsa State. President Goodluck Jonathan, who was represented at the event by the Minister of Culture and Tourism, Chief Edem Duke, commended the Bayelsa governor for honoring the memory of Mandela. He reminded guests that the federal government had earlier declared three days of mourning in recognition of the great contributions of the late icon to the emancipation of the black race. He said the dedication of such a major event to Mandela, points to the sterling leadership qualities of Governor Dickson. “I am extremely delighted that this government dedicated this evening of jazz to celebrate an icon, whose struggle, vision, quality, courage, passion, commitment, belief, and whose integrity is definitive of the new and emerging leaders of Africa,” he said. South Africa High Commissioner to Nigeria, Mr. Lulu Louis Mnguni, while expressing gratitude for the recognition given Mandela, said that the event also presented an opportunity to celebrate musicians such as Masekela and Fela Anikulapo-Kuti who fought apartheid through music. Rwandan envoy, Mr. Joseph Habineza, equally had words of praise for the people of Bayelsa as he described their state as the emerging Las Vegas of Africa. It wasn’t only the South African maestro who was honored by the Bayelsa State government. Governor Dickson also announced the donation of N200 million as the initial sum for the establishment of a music school in the state and an endowment fund for Ijaw artistes. Timaya, Timi Dakolo, Most Beautiful Girl in Nigeria and Honorary Special Adviser to the Governor on Tourism, Anne Banner joined him in presenting the donation to the Director General of the state’s tourism agency, Ebizi Ndomu-Brown. Dickson who stressed his commitment to youth empowerment, called on young people in the state to take advantage of the opportunities presented by his administration. It definitely wasn’t a night for speeches. Rather it was a harvest of world-class entertainment. Though, jazz super star, Earl Klugh sent his apologies via a video message, he wasn’t missed, as the artistes on the night were superb. There never was a dull moment, not even for new entrants in jazz music. Starting from Ego whose smooth jazz tunes set the standard for the night. She showed fun seekers why her voice is celebrated. Then there was African jazz groove from Ogangbe, the 7-piece Benin Republic band that has worked with big names like Femi Kuti and Lagbaja. There was also the invigorating performance from jazz vocalist and instrumentalist, Lekan Babalola. The lanky musician and his 14-member crew that included the Eko Brass Band got the crowd singing along. Then, there was the energetic drum session by South Africa-based, Delta-born drummer, Daniel Isele. He heralded the entrance of the 22-man Naijazz All-Stars Band. Highflying jazz vocalist, Somi also had a good time on stage. Her three-song set ended with her cover of Fela’s ‘Lady’. 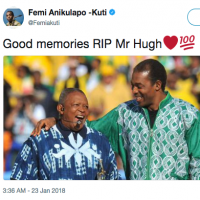 Undoubtedly, South African trumpeter and vocalist, Hugh Masekela and Femi Kuti were the star attractions for the Bayelsa International Jazz festival. Their five-star performances ensured that they lived up to the hype. Masekela whose vigour and stagecraft makes it hard to believe that he is 74-years-old got a standing ovation after his performance. The music icon, who along with his band, performed in the Ijaw traditional attires, channeled late Afrobeat creator, Fela Anikulapo-Kuti with his version of ‘Lady’. He further won the hearts of guests at the show when he pronounced very well Izonkene, the name given him by Governor Dickson. Femi Kuti and his band took their turn on stage. He promised to give Bayelsans a taste of what is enjoyed at the New Afrika Shrine and he did. Despite the semi-formal atmosphere at the show, Femi’s dancers were at their best moving their bodies like they do back in their base. Most men at the show had an eyeful of the fire dance African women are known for. Femi, who joined the girls at some point for dance sessions, as usual didn’t spare government his dosage of ‘yabis’. Though, he commended Governor Dickson for the developmental projects dotting the state, he advised that more should be done to improve the lot of Bayelsans. Songs like ‘Sorry Sorry’, ‘Truth Don Die’, ‘Dem Bobo’, ‘Bang Bang Bang’ and ‘Water’ got the 4th Grammy nominee loud cheers from the crowd. The show lasted till the early hours of Sunday, but the happiness exhibited by fun seekers was indicative of the fact that it had what it takes to become a major event in the Nigeria’s tourism calendar. 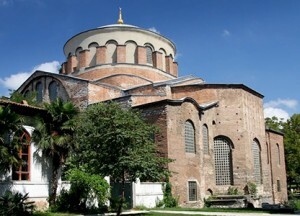 The evening concert at Istanbul’s famed Hagia Irene will feature performances by stellar musicians from around the world, including pianists John Beasley, George Duke, Robert Glasper, Herbie Hancock, Ramsey Lewis, Keiko Matsui and Eddie Palmieri; vocalists Rubén Blades, Al Jarreau, Milton Nascimento, Dianne Reeves and Joss Stone; trumpeters Terence Blanchard, Imer Demirer and Hugh Masekela; bassists James Genus, Marcus Miller, Esperanza Spalding and Ben Williams; drummers Terri Lyne Carrington and Vinnie Colaiuta; guitarists Bilal Karaman, John McLaughlin, Lee Ritenour and Joe Louis Walker; saxophonists Dale Barlow, Igor Butman, Branford Marsalis, Wayne Shorter and Liu Yuan; clarinetists Anat Cohen and Hüsnü Şenlendirici; violinist Jean-Luc Ponty; Pedrito Martinez and Zakir Hussain on percussion and other special guests. John Beasley will be the event’s musical director. It was a fine way to celebrate a 21st birthday: blistering temperatures, beautiful surroundings and plenty to learn from your elders. Some of the leading perfomers at WOMADelaide in Adelaide’s Botanic Park were more than a match for their superannuated peers in the world of rock when it came to demonstrating that near-enough eligibility for a senior citizen’s card is no barrier to putting on a show. For my tastes, the 64-year-old Jimmy Cliff on Saturday night was a bit too much the showman – particularly with his version of Hakuna Matata from The Lion King – but his contemporary Salif Keita was spellbinding once his band found their groove earlier the same night. Keita was one of three leading acts from Mali at the festival this year, with a focus on that country because of the political turmoil and jihadist uprising. Vieux Farka Touré may always struggle to escape the shadow of his father, the late Ali Farka Touré, but Bassekou Kouyaté – whose family have played the ngoni for generations – is already well on his way to becoming a true star. His son, Mustafa, is in his band now, and took an impressive solo during their performance on the main stage on Friday night; but the look on his face later when his old man let rip with his instrument, making liberal use of his wah-wah pedal, told its own story. Like everyone in the audience, he just puffed out his cheeks as if to say “Woah!”. Bassekou and co were busy playing throughout the weekend – plus there was an appearance from his wife (and vocalist in the group) Amy at the Taste the World stage, where acts show off their cooking skills, one of the measures of WOMADelaide’s civilised demeanour. I especially liked the sound of Novalima’s ceviche, and the band of expat Peruvians also excelled on the third stage on Sunday afternoon. Likewise Brooklyn-based Afrobeat outfit Antibalas on Saturday, whose performance was perhaps especially charged because singer Amayo had heard the news the night before that his mother had passed away in his native Lagos; and also Moriarty, a band from France whose parents mostly came from the US, and who sound like they come from the backroads, somewhere way off any interstate. It was, as well, a joy to get a sense of the rich diversity of musical life in this corner of the planet. The festival began with a traditional kaurna greeting from Stevie Goldsmith and dancers and encompassed a bluesy-take on Aboriginal music from East Journey, who come from the Yirrkala community in North East Arnhem Land; also a performance from Sing Sing, involving acts from across Oceania; vibrant Aussie hip-hop from the Herd; and two of the most talked-about acts in the country. If Stevie Goldsmith represents a tradition that is several millennia old, Melbourne band the Cat Empire who headlined the main stage on Friday night may well stand for the future, with their kitchen-sink appropriation of genres from around the globe, including hip-hop, reggae and salsa. Similarly brave, in their own way, were funk-soul champions the Bamboos on Sunday, who’ve added a bit of gnarled rock to their schtick thanks to guest frontman Tim Rogers. Both acts drew vast crowds in the relative cool of the evening (it was still sticky in the pitch dark). With more than 470 performers from 26 countries appearing over the course of the four days, any review could only scratch the surface of WOMADelaide: there was also the much talked about “Blank Page”, performance art from the Compagnie Luc Amoros (looked good, even if the political messaging was a bit gauche); lots of buzz for the electro-swing of UK act the Correspondents (not to my taste, alas); the rock of the delicate-looking Algerian singer Souad Massi (inviting some dangerous-looking dancing as temperatures touched 40 degrees on Sunday afternoon); and Balkan swagger of that evening’s headliner Goran Bregovic. Bregovic came within a whisker of stealing the weekend. The Marco Pierre White lookalike is a masterful chef d’orchestre, as they say in other parts of the world; he looked like the boss man in his immaculate silver suit, but stay seated for most of his by turns moving and then uproarious performance, letting his superb 18-piece band – involving, I think, a mixture of authentic Gypsy players such as the Kosovan refugee goc drummer Muharem Redzepi and conservatory pros including saxophonist Stojan Dimovget – get on with it. But for the odd moment when he did calm things down – as with a rendition of his hilarious In the Death Car – he mesmerised, too. Someone at the festival (was it the band Moriarty?) said that Adelaide has the highest number of serial killers per head of population in the world. I don’t know about that. But on the basis of the dancing as Bregovic’s set came to a close, there were certainly plenty of bona fide nutters there. 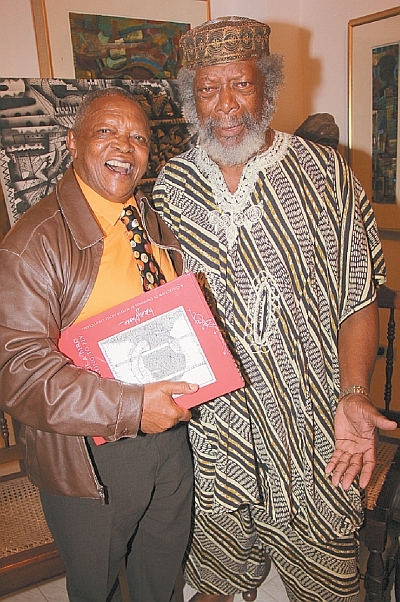 Best of all for this reviewer, though, as previously described, was Hugh Masekela, who headlined on Saturday, but also hung around the festival site all weekend, giving a talk in Speakers Corner and guesting on the Monday with the Soweto Gospel Choir. He showed with his own performance how he has learned to entertain over the years – busting some dance moves, playing famous songs such as Stimela, talking about the environment (“Let’s make a resolution that when we see someone shitting on nature, we’re going to say ‘get off the pot! '”); but it’s when he blows softly on his horn that the real magic is there. It is said that 11 of the world’s 20 fastest growing economies are in Africa, but when you talk about the economy, who are you talking about? The rich will benefit but the poor will always remain poor. In China, the economy is booming, but the poverty rate there is appalling; the US economy is the biggest in the world, but poverty there is appalling, too. So when you talk to me about the economy, in my mind that translates as “the establishment”. The ones who run the economy, the ones who own it, are the ones who benefit from it. In my view, Africa’s real problems are cultural. In 20 years from now, when people ask my grandchildren who they are, they’ll say “it is rumoured that we used to be Africans – long ago”. I’m very interested in heritage restoration, and I’m working with a group of people to create a number of academies and performance spaces to encourage native arts and crafts and to explore African history. I’ve got to where am in life not because of something I brought to the world but through something I found – the wealth of African culture. Africa was not only conquered, but in conquest, through the imposition of new religions and the misunderstanding of the aims of education, and later on through advertising, Africans were manipulated into thinking that their own heritage is backward: primitive, pagan, heathen, barbaric. We need a renaissance to celebrate the wealth of diversity that really exists. Now, a renaissance is very expensive, but you don’t have to force a thing on people who already own it, you just have to make the space for it to show it off – you let it grow from there. If there’s going to be cultural advancement, it’s going to have to come from the people themselves, but they have to be helped. It’s obvious that the rest of the world loves high African culture – African culture, period. Just look at a festival like WOMADelaide. But when people come to Africa they can’t find it that easily because the African establishment has no interest in celebrating it. Governments in Africa – most governments, in fact – are allergic to this because they don’t want to be upstaged. And it’s to the benefit of international industry that the people of Africa remain an underclass – so they won’t take ownership of the raw materials themselves. But if Africans recapture their culture they will naturally gravitate towards recapturing the continent. If they know more of who they are, they might not be willing to be so subservient. It’s not just Africa’s problem; most of the world now has disappeared into laptops and iPhones and iPads. People think think that when they have these gadgets they are advancing. Technology keeps changing the world, but music doesn’t change, it’s only 12 notes and six chords and it’ll always be that. It’s how they’re juggled that makes great music and great musicians study that, whether it’s Palestrina or Bach or Fela [Kuti]. But if you’re into the dark glasses and chicks with their asses in the air and in your face … I don’t know how much of it is music. People talk to me about the rise of hip hop in Africa, too, but nothing that mechanical will last. The people look alike, and they’re wearing the same outfits, and they’re singing variations or rapping variations of the same thing. And yet the Hawaiians and the Indians sing variations of the same scales, but in there are beautiful songs, beautiful melodies. Anything that comes organically from people, musically, is what will last for ever. But what depends on a machine will always depend upon a machine. Until a bigger machine comes. “Day 2 of WOMADelaide began with a talk from Hugh Masekela at the Speakers Corner stage. This is Caspar Llewellyn Smith again. On this Saturday morning, in a front of a crowd desperately fanning themselves in the sticky heat, he was at it again, a little bit, casually mentioning his friendship with Bob Marley, for instance. But he can’t help it if he’s known and worked with several of the greats, because he is one himself, and a measure of that was his insistence here, talking of politics, that “the ordinary person is the hero of every society. In a place like South Africa, the real heroes are the unknown people”. It was also a delight to hear Masekela talk about the importance to him of his school geography lessons: “we learnt how to draw the outline of every country, their physical features .. their products, their climate” etc, which, he complained doesn’t happen any more. 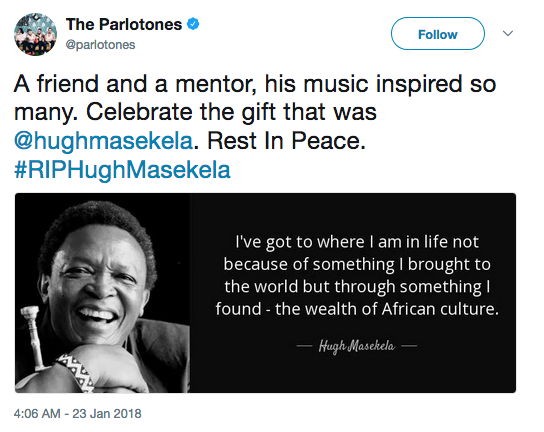 It meant that when he left South Africa after the Sharpeville Massacre in 1960 and started his peripatetic existence that continues to this day – he has homes in South Africa, Ghana and California, though as he told me “I live in airports and hotels and festivals” – nowhere he went felt foreign to him. 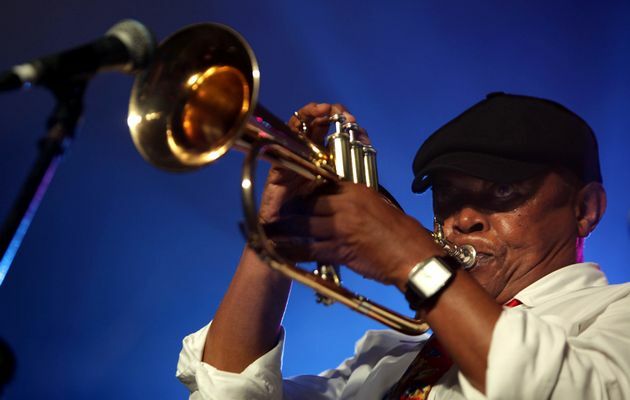 Veteran trumpeter Hugh Masekela followed in Archbishop Desmond Tutu’s footsteps in being honoured with a “Keepers of the Flame” award at the African American Church Inaugural Ball on Sunday night. The event – to honour Barack Obama’s re-election as US president – follows the one in 2009 when Obama assumed office. Masekela performed a musical tribute to former president Nelson Mandela at the black-tie event held at The Grand Hyatt in Washington. 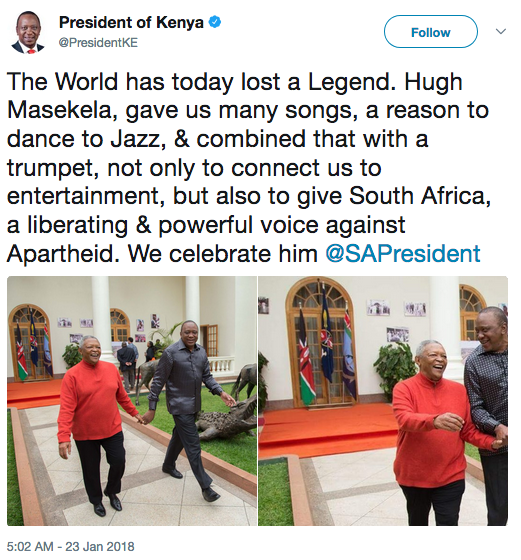 The event’s programme read: “Hugh Masekela is a world-renowned musician, composer, and a defiant political voice who remains deeply connected to his homeland and the world. The event was themed “Lift Every Voice and Sing”. Others honoured included boxing legend Muhammad Ali; the first African American astronaut candidate, Ed Dwight; the first African American to be appointed as surgeon-general of the US, Jocelyn Elders; and singer Aretha Franklin. The Rev W Franklyn Richardson, who is the chairman of the Conference of National Black Churches, hosted the event. Those honoured in 2009 included author and poet Maya Angelou, publisher and philanthropist Earl Graves snr, civil rights activist and Baptist minister the Rev Al Sharpton and Tutu. 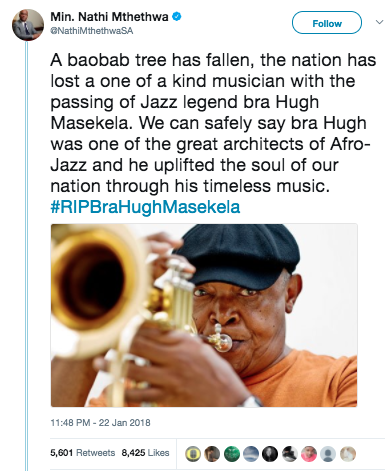 Journalist Roland Martin tweeted yesterday: “Just got a wonderful word of encouragement from South African artist Hugh Masekela! He said I have lots of fans in the Motherland! #honored [sic]. The African American Church Inaugural Ball will be held on Sunday, January 20, 2013, at 6 p.m. at the Grand Hyatt Washington. Like its premiere event in 2009, this year’s event will feature leaders and influencers from the religious, civic, business, arts, and entertainment communities. Attendees will gather to honor the 44th U.S. president, Barack Obama, and the great history and strength of the African American church, and its impact on the community. Themed, “Lift Every Voice and Sing,” the African American Church Inaugural Ball will honor extraordinary leaders with the “2013 Keepers of the Flame” Award. The recipients are individuals who have sustained an unshakable commitment to our future and who have earned an undeniable place in the African American book of history. Confirmed honorees include: Muhammad Ali; Bishop George E. Battle, Jr.; Bishop Philip R. Cousin, Sr.; Andraé Crouch; Ed Dwight; Joycelyn Elders, MD; Bishop William H. Graves, Sr.; Rev. Dr. Cynthia Hale; Hugh Masekela; Rev. Dr. Otis J. Moss, Jr.; Jessye Norman; Beny Primm, MD, and Cicely Tyson. Other honorees to be confirmed include: The Honorable Andrew Young, Hon. William J. Clinton, Ruby Dee, Aretha Franklin, Rev. Dr. Cain Hope Felder, Rev. 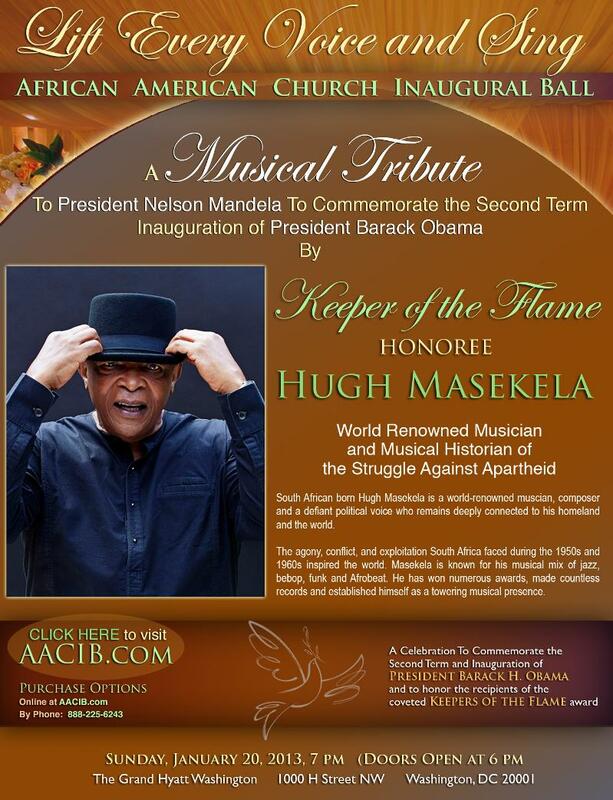 Dr. Katie Cannon, and Dr. Vernon J. Jordan, Sr.
As part of the evening’s celebration, musical legend and 2013 Keeper of the Flame Honoree Hugh Masekela to present a musical tribute to SA President Nelson Mandela in honor of President Barack H. Obama. “A new day is dawning, as the leadership of African American churches mark another historic moment in America’s history, while making a commitment to address health disparities, including the enormous challenges of HIV/AIDS, hepatitis C, cervical cancer, and sexual violence,” said Seele. For more information on the African American Church Inaugural Ball, visit www.AACIB.com. For more information on Pernessa Seele and The Balm In Gilead, visit www.balmingilead.org.